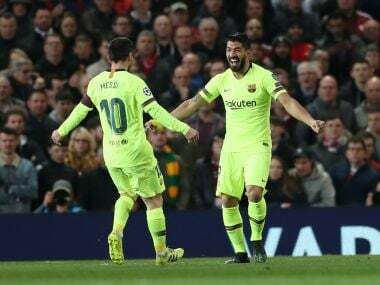 Madrid: Lionel Messi marked his 400th appearance in La Liga with the opening goal in Barcelona's 3-0 win over struggling Levante at the Camp Nou on Sunday as the Catalans prepare to unveil Philippe Coutinho. 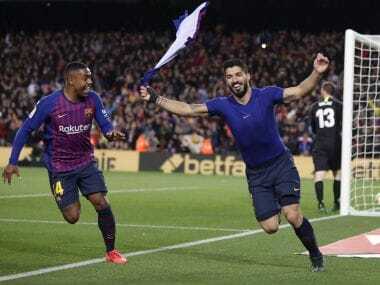 Messi's 365th goal in Spain's top flight was followed by strikes from Luis Suarez and Paulinho as Barcelona stretched their lead at the top of the table back to nine points over Atletico Madrid. They are also now a massive 16 points clear of defending champions Real Madrid, who were held to a 2-2 draw away at Celta Vigo despite a brace from Gareth Bale, and remain fourth. Barcelona are still unbeaten in La Liga this season and on Monday will officially unveil Coutinho following the Brazilian's 160 million-euro ($192 million) move from Liverpool. 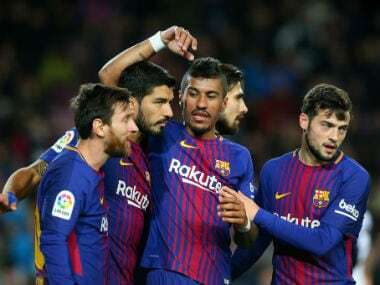 With all the talk about Coutinho, coach Ernesto Valverde was eager for his side to keep their focus on winning their first league outing since beating Real Madrid 3-0 in the Clasico on 23 December. "Levante had not lost away since September. We were very good in the first half, but the rhythm was not the same in the second half," said Valverde. 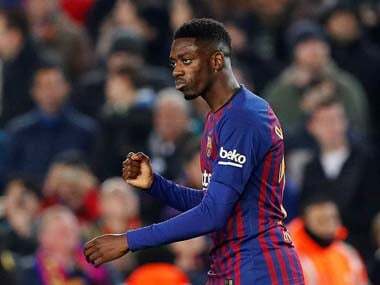 Barcelona's previous record recruit Ousmane Dembele – a 105 million-euro buy from Borussia Dortmund in the summer – was included in the line-up for the first time since tearing his hamstring nearly four months ago. He came close to scoring on a couple of occasions, including from one 20-yard strike that was beaten away by Levante goalkeeper Oier Olazabal. "I think he has to bring something to the team, and he also has to face up to the competition for places and for the tackles he will face on the pitch, from opponents who don't want to let him past," said Valverde. "It is a process, but I thought he looked good and we still hope he can improve." It was Messi who broke the deadlock with a fine first-time finish in off the post from a Jordi Alba assist for his 16th league goal of the campaign in the 12th minute. The second goal arrived seven minutes before the interval, as Suarez controlled Sergi Roberto's fine ball into the box before firing home. It was the Uruguayan's 400th professional goal, his 131st for Barca putting him seventh on the club's all-time list of leading scorers. 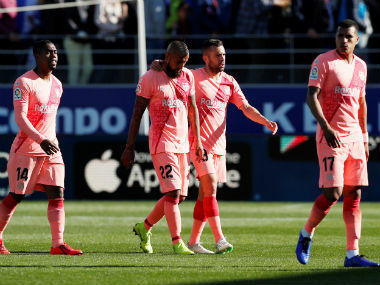 Barca rounded out the victory in the third minute of added time as Messi's low ball across goal at the end of a jinking run was turned in by Paulinho. Madrid were without the injured Sergio Ramos and the suspended Dani Carvajal in Vigo and their makeshift defence was exposed when Daniel Wass put the hosts ahead in the 33rd minute. The Dane was afforded acres of space although his chipped finish over Keylor Navas from the edge of the box was still a delight. With Karim Benzema injured, Bale and Cristiano Ronaldo started together for the first time since late September. And it was Bale who quickly turned the game around, slotting home from a finely weighted pass by Toni Kroos in the 36th minute and then beating the offside trap to prod in an Isco pass two minutes later. However, Celta fought back after the break to claim a deserved point. Iago Aspas saw a 72nd-minute penalty saved by Navas after he had been fouled by the Costa Rican goalkeeper, but Maxi Gomez rose unmarked to head in a Wass cross eight minutes from time. Zinedine Zidane's side do still have a game in hand on the sides above them but they are now only one point further away from the relegation zone than they are from Barcelona. "We made too many mistakes and lost the ball too often, especially in the second half," said Zidane. However, he insisted he isn't looking for reinforcements in the January transfer window. "We'll see what happens but at the moment I am happy with my squad." Second-placed Atletico beat Getafe 2-0 on Saturday, with Diego Costa scoring and then being sent off in his first league appearance since returning to the club from Chelsea.